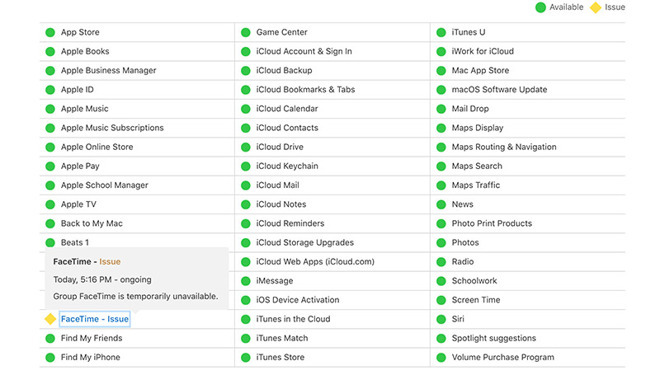 Apple quietly announced the takedown on its System Status webpage, which as of this writing shows Group FaceTime as unavailable due to an “ongoing issue.” The company does not offer a timeline on a resolution, though a fix to the underlying flaw is in the works. Earlier today, reports of a particularly nasty FaceTime bug surfaced on social media. First documented by Benji Mobb on Twitter, anyone can activate the glitch by calling another FaceTime user and manually adding the originating number to the call as a third party. Once added, access to the recipient’s microphone is granted even if they do not answer the call. Through further experimentation it was discovered that camera access is also granted — however briefly — when a recipient presses iPhone’s power or volume buttons to decline the incoming call. AppleInsider confirmed the exploit works on current iPhone and Mac devices, including the latest iPhone XS and XR models. Considering the ramifications of allowing interlopers easy access to microphone and camera hardware, and Apple’s staunch commitment consumer privacy, the Group FaceTime takedown does not come as a surprise. Apple in a statement to media outlets said it is aware of the problem and is working on a fix that should be released later this week. Group FaceTime will presumably be inaccessible until the update is pushed out. While the service shutdown should solve the issue in the interim, concerned users can disable FaceTime on their devices by navigating to Settings > FaceTime and toggling the FaceTime button to the off position.